Low light scenarios can be challenging when producing live streams. We recent streamed a music festival, where we came up with some helpful solutions for this. This video will cover tips for optimizing lighting in low light video production. The first basic rule of video that we need to consider is called the “180 Degree Shutter Speed Angle Rule“. This rule says that our frame rate should be half our shutter speed or put another way our shutter speed should be double our frame rate. This rule ensures that our video looks smooth and the closest to what our eyes are used to seeing in real life. If we start to have a shutter speed that is to fast, our images look to clear and crisp. Many people use the “Saving Private Ryan” introductory sequence as an example of where shutter speed and frame rates have been purposely increased to give a feel of extreme detail and super fast crisp video. But if you wave your hand in front of your face you will see that normal eyes will see blurry motion which is what the “180 Degree Shutter Speed Angle Rule” was designed to match. Assuming, that we are using the 180 Degree Shutter Speed Angle Rule in a low light scenario we realize that usually live streaming video producers will choose 30 frames per second unless there is a real reason to use 60fps. Thirty frames per second are used by live streaming producers to match what is seen on television and cinema. This frame rate allows us to use a shutter speed of 1/60 which lets a lot of light into our video sensor. Now that we have covered frame rate and shutter speed, the last major low light camera exposure setting is aperture. In low light scenarios, you almost always want to open up the iris of your camera as much as you can. This is done by lowering the aperture. On a PTZOptics camera, you would lower the aperture down to 1.4. 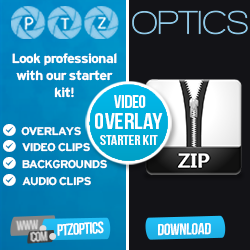 The goal for our low light settings is to achieve the ideal exposure from our PTZOptics camera. This is done with a combination of exposure, image and noise reduction settings. If you plan to use software for color correction you may want to setup your camera to output a “flat image” to take full advantage of your sensor. If you do not have access to color correction software you may want to use the camera setting alone. 2D Noise Reduction – Ideal for scenes with a lot of movement. 3D Noise Reduction – Ideal for static fields of view. When you are using a PTZOptics camera connected to your local area network, you can remotely adjust your exposure and noise reduction controls. The PTZOptics IP Controller apps are being updated for better supporting low light applications remotely, but all the functionality of low light camera settings are still available with the latest camera firmware. There are two camera operation modes that are most popular for live streaming an event that will require manual adjustments. You can leave the camera in auto exposure mode and simply make manual adjustments to luminance and contrast OR you can leave the camera in full manual mode. The difference is that full manual mode will give you more control and is ideal for very low light scenes. For example, you may want to use an automatic exposure mode when you are expecting the lighting for an outdoor event to be changing throughout the day. You can quickly adjust the contrast and luminance remotely using the PTZ apps, but you don’t want to manually adjust iris and shutter speed. On the other hand, you could also leave the PTZ cameras set to manual for low light and have the iris all the way open and your shutter speed set to respect the 180-degree shutter speed angle rule. The above pictures show the camera set to a manual mode with the iris set to F1.8 and the shutter speed at 1/60. The main difference between these two pictures is the adjustment of gain and Wide Dynamic Range Control. As you can see, once you start adding gain and DRC the image becomes brighter. Ideally you want to adjust the gain until you see noise in your image. The same is true for Wide Dynamic Range Control. Once your image is starting to look better you can reduce noise by using 2D and 3D noise reduction inside the camera. The last concept you should be aware of is producing a flat image. A flat video camera image is an image that gets the most possible data from your CMOS sensor. If you camera has too much contrast or blacks that are clipping you could be losing data. You may want to produce an image that looks a little over exposed so that you can use that data in post production with your video editing software or using live color correction tools. We show above what can be done with the color correction tools inside vMix.